Children at weddings – invite or not? Getting married? 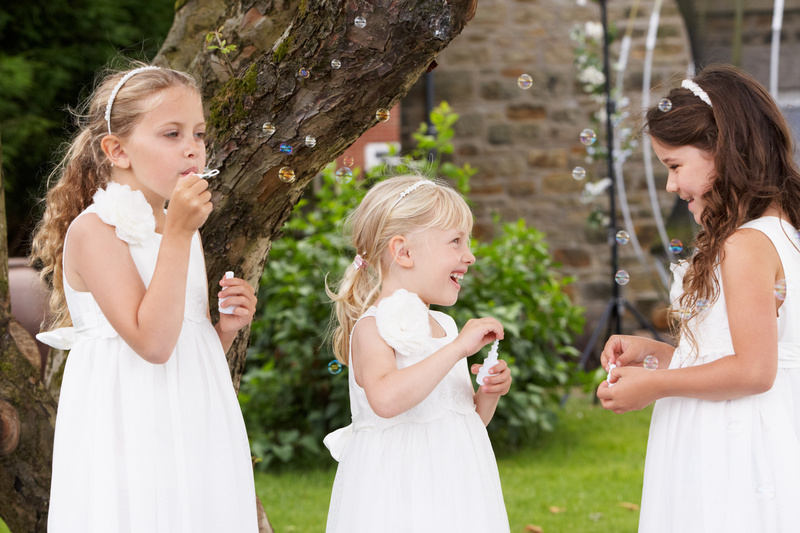 Are you having a debate about whether to invite children to your big day? Not sure what to do? You’re not alone. Many couples face this dilemma. Children at a wedding bring a smile to everyone’s face – an angelic flower girl scattering rose petals, the cheeky grin of a toddler in family photos or a tot strutting their stuff on the dance floor. It’s inclusive, less likely to offend someone and makes it possible for guests who don’t have childcare to attend. But on the flipside, children don’t always follow the script. Boredom can set in and overtiredness can lead to meltdowns. If your idea of a perfect wedding is one that everything goes exactly to plan, adding children to the mix may scupper your dream day, unless you plan ahead and give them a dream day too. 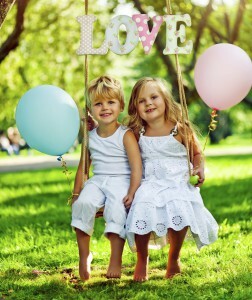 That depends on whether you would like the fun and innocence that children add to a wedding. If you have many friends or family members with children – or if you have children yourself – we’d recommend including children but make plans to ensure they stay happy (see our suggestions below.) If very few of your friends have children and you’d prefer a more formal, stylish, grown up affair, then having children there might be out of place. Even so, there are things you can do for the few that have children to show them that you’ve considered their needs. Will we offend people if we don’t invite their children? This will depend on your friends and family. For some, a night out without the kids is a treat. For others, getting childcare is an issue and would make it impossible to attend. Most people realise that weddings can be a long day for children and don’t automatically expect children to be provided for, but some do. Think of the weddings you’ve been to – have they typically had children there or not? That is normally an indicator of what your family or friends’ expectations are. We want children there but worry about them making a noise during the ceremony. What can we do about that? Children – particularly toddlers and babies – don’t know when they need to be quiet. Having a toddler shout out something cute midway through a ceremony can make everyone smile, but equally, a baby crying throughout your vows isn’t ideal. If you’d like to include children in your wedding but would rather have the ceremony go without interruption, consider getting a mobile crèche or nannies. This can be for just a few hours during the ceremony or for the entire day. What about during the meal and speeches – how can we ensure kids are taken care of? Get some special goody bags or activity books to keep the children entertained during the speeches and ensure there are child-friendly meal options available. You can also consider hiring a nanny / nannies or mobile crèche for the day to take care of the children in a separate space during key moments so that parents can enjoy the day, knowing that their children are having a great time too. See our other tips below. What happens in the evening and the children need to go to bed? Consider offering babysitting or nannies. They can take sleepy children off to their parent’s rooms – if guests are staying at the wedding reception venue – or you could arrange a mobile crèche that includes a play space for kids and a sleep zone for naps or bedtime. They will come to your venue for a few hours or the whole day. They can accompany an individual family or care for a small number of children in a separate room and keep them amused and entertained with toys and activities. Hiring an event nanny is a flexible option as it can be tailored to the families’ specific needs. These are ideal for guests that want to stay at the event into the evening or those just attending your evening reception. Little ones can go to bed whilst their parents enjoy the nighttime celebrations. The babysitters will come to the venue and look after the children in their own rooms, feed or supervise their dinnertime and get them ready for and put them to bed if required. Babysitters will most likely be off duty nannies, nursery nurses and childminders and hold a DBS check and First aid certificate. This is a brilliant solution if you have a lot of children attending your wedding, especially if they are a variety of ages. It will wow your adult and child guests alike. A crèche will provide a safe, fun environment filled with toys, activities, and games to keep everyone amused for hours. Depending on your requirements they may include arts and crafts, musical equipment, floor toys, party games, technology, a DVD player, educational and stimulating toys, a baby play area – soft flooring, baby toys, walkers, a bedtime area, story corner or outdoor games. Crèches are completely tailored to fit around your day, whether that is the whole day, a couple of hours during the ceremony, wedding breakfast and speeches, or in to the evening and become a snooze zone / quieter space until the reception ends. If you would like the children more involved, we can set up a play area – all the fun and games of our crèche but set up in the same area as the event so it is more inclusive and parents can join in too. The perfect solution to keep your little guests happy! Children love to be included and we find the best way to do this is through fun and engaging activities. 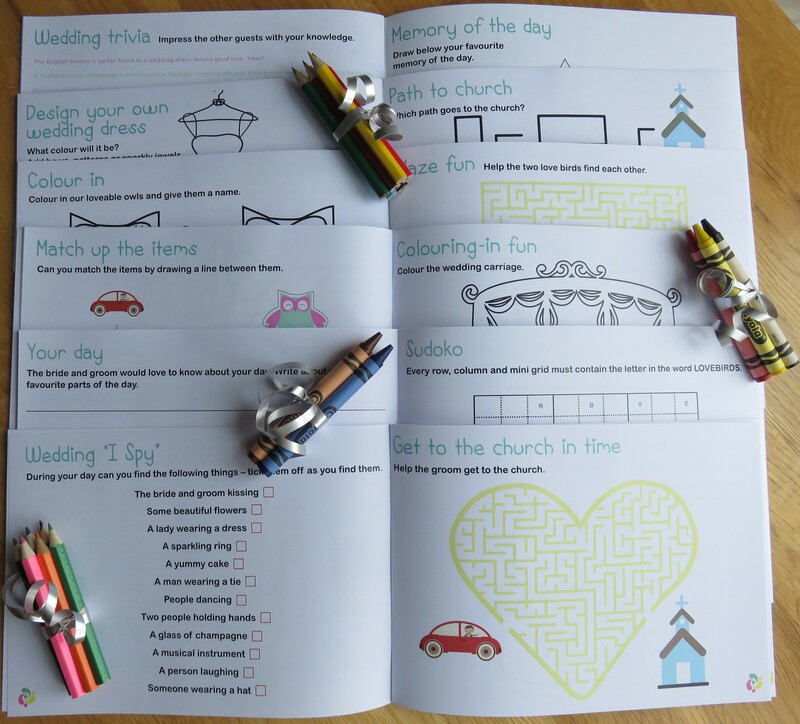 Our wedding activity books are for children aged three to 10 years and are full of fun activities, colouring, word games, mazes, jokes, puzzles, table games and more! Activity books can be personalised with the child’s name on the front so they can be used to highlight their seating place at the table or added to a bag/box with a few extras to create a special favour for the children. Extras could include magic tricks, balloons, some sweets, playing cards, a small toy or some modelling clay. Our activity books are available online at Etsy. Set up a table during your reception with colouring paper (print off colouring pictures/activities from websites such as http://www.activityvillage.co.uk/, pencils, crayons, and stickers as something for children to do. Consider setting a competition, ask the children to draw something specific like the bride and groom and ask the best man to judge and announce a winner during the speeches. Tip – NO PAINT! Be mindful where you sit parents with young babies. They may need extra space to have pushchair nearby or those with young children that are likely to need to be close to the toilets/changing facilities, or an exit if the child is having a meltdown. Don’t expect young children to eat the same as the adult. Organise a kid’s meal or a picnic box style meal. Tip – include a small toy or activity book inside to keep them amused. If you have space outside consider organising a scavenger hunt, garden games (Jenga, Giant Connect Four) or even a bouncy castle. Ask the bar to ensure there is a jug of water or diluted juice available or try boxes of juice as they won’t spill. TIP – stay away from fizzy or anything with artificial flavours and colourings! Make your little guests a part of the day by giving them a role and job to do. 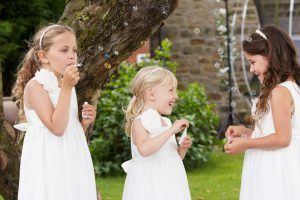 Flower girls, ring bearers, confetti throwers or ask them to pass out the confetti to guest – all of these make children feel needed and can keep them out of mischief. Disposable cameras – let children play photographer for the day. It will certainly produce some funny snaps from a child’s perspective. Have a cosy quiet corner or separate room – cushions, books, TV/DVDs – somewhere the teenagers can hang out and tired little ones can wind down and go for a snooze. Entertainment – if you have lots of space or a separate room you could look at booking a crèche, magician, or balloon modeller to keep the children occupied. Avoid having a children’s only table unless you have someone to oversee it and lend a hand. Keep a selection of ‘child friendly canapes’ (light snacks) on hand to keep little ones going and reduce the chances of hunger meltdowns if there are any delays waiting for the meal. We hope that helps answer some of your questions. But if you have any others or want to find out more about our wedding childcare services, get in touch.